There are many opportunities for alumni to stay connected and get involved with the Factor-Inwentash Faculty of Social Work. Below you will find further information about the different ways that you can stay in touch. Update your contact information with the University of Toronto and the Factor-Inwentash Faculty of Social Work to stay connected with the Faculty and University. Subscribe to the Faculty’s alumni listserv, where you will receive a weekly alumni digest via email with upcoming events and job postings. All graduates of the Factor-Inwentash Faculty of Social Work are members of the Alumni Association. Through the Association, those who wish may become actively involved in Faculty and university life in a wide variety of ways. For further information, visit the link above or contact alumni.fifsw@utoronto.ca or 416-978-4437. The Practicum is one of the most important elements in the education of future social workers. It’s where Master of Social Work students apply their in-class knowledge to practice and develop important skills, in real-world settings. Field Instructors play a vital role in our students’ education and training. As experienced social workers who adhere to Field Instruction Standards, they oversee and guide our students in the provision of services to a variety of clients, organizations and communities. For further information, visit the link above or contact Mindy Coplevitch at m.coplevitch@utoronto.ca or 416-978-5664. Alumni provide inspirational examples of what graduates accomplish. By sharing their experiences and answering questions, alumni can be an invaluable source of support to graduating students who are embarking on an important and exciting phase of their lives. For further information, visit the link above or contact Leneque Wilson at leneque.wilson@utoronto.ca. Consider a gift to the Factor-Inwentash Faculty of Social Work, whether to the FIFSW Alumni Scholarship, the Alumni Association Distinguished Speakers Series or to an area of greatest need. Attend an event hosted by the Factor-Inwentash Faculty of Social Work. Visit our Events Calendar to see a list of upcoming events or update your contact information to receive updates about upcoming events. 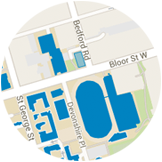 Note: The University of Toronto respects your privacy. Personal information that you prvovide to the University is at all times protected in accordance with the Freedom of Information and Protection of Privacy Act.